I usually do not add more than a single chapter to my blog per week. I would like to make this an exception due to an etching I bought earlier this week and what day today, 2 June 2013, happens to be. Today is the 60th anniversary of our Monarchs, Elizabeth II, coronation. At the young age of 25, she took the throne after the death of her father, King George VI. The #coronation ceremony was held more than a year after the accession. This followed the tradition that a festival such as a coronation was inappropriate during the period of mourning that followed the death of the preceding sovereign. The doors to Westminster Abbey were opened at 6am to the approximately 8,000 guests invited from across the Commonwealth. When her grandfather (1911) was crowned artists such as Joseph Pennell, Laurits Tuxen, Bacon, Gillot, as well as a couple of photographers were there to record the event on paper, canvas and film. This etching is from 28 Feb. 1922 with the marriage of Princess Mary (only daughter of King George V) and Viscount Lascelles (later Earl of Harewood). The etching is initialled ‘FB’ (#FrankBrangwyn) but untitled and undated and un-numbered. Brangwyn was commissioned to design street decorations for the coronation. This stunning image with the sunlight dappling the throne and dais displays the enormity and vastness of Westminster Abbey. Unlike Pennell’s etching which was drawn from the organ loft. The perspective here is from ground level. You feel the crowd pressing on all sides and wish for the vast space above you. A sacred space worthy of such royal duties. A n image well worth today’s anniversary celebration. I hope you enjoy. I have via a new friend and long time lover of art and etching that this image is titled ‘Westminster Abbey’ and by Frank Brangwyn. Thanks John. 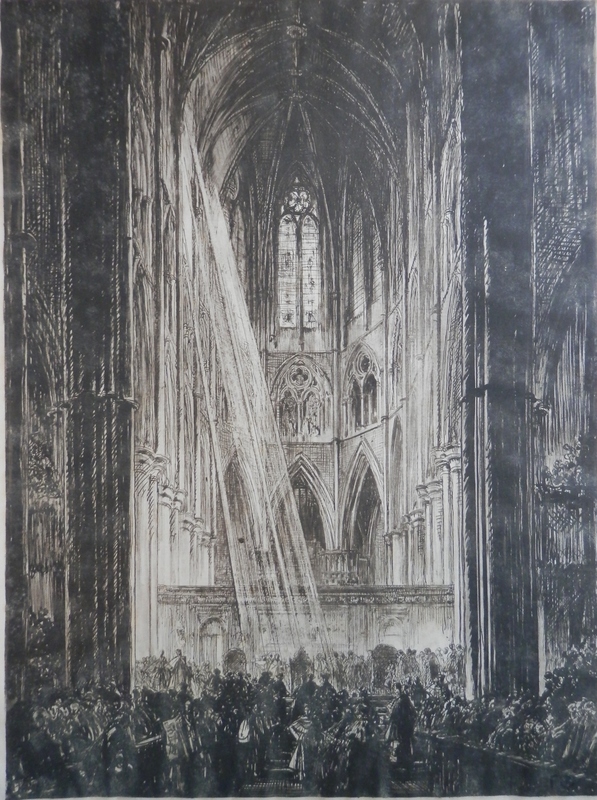 This entry was posted in Etching and tagged coronaton, dais, Frank Brangwyn, royalty, sunbeam, throne, Westminster Abbey. Bookmark the permalink.